Despite GameDealsCanada.com’s successful launch, I’ve found myself busy with scrounging up deals, updating the site with posts and tweaking banners on Thursdays. So I’m going to move “Savestate” posts to Tuesdays. We’ll see how that works out. In other news, I’m still struggling to establish a good wireless bridging solution with my ASUS RT-N66U and RT-N16. The RT-N16 isn’t great as a repeater. I’m not sure if it’s the firmware or the hardware at this point. It could be a combination of both. More testing and pondering required. I’m making my way through Wind Waker HD. I’m enjoying it and I’m thankful for all the gameplay tweaks. There’s a lot of sailing. A lot of sailing. Really high highs and calming seemingly endless blue lows. I need to get that faster sail as soon as possible. On top of that it’s been FIFA 15 and Dual Destinies. The latter is at its final stages. I’m a big fan of Mini-ITX motherboards. I’ve built one mini-itx build last year and I’m in the middle of building another. They have everything I need for a modern computer in a small form factor. 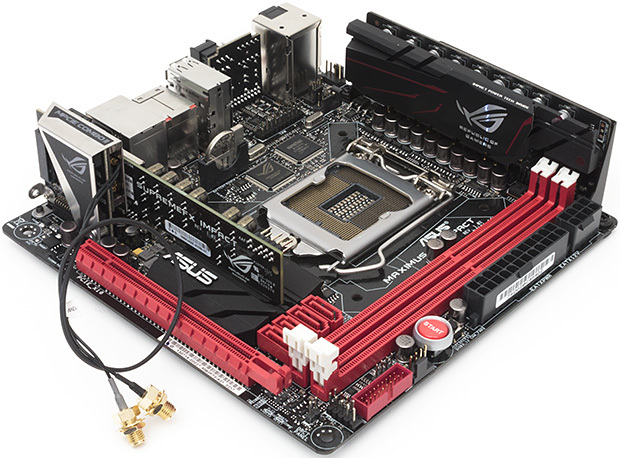 But I have never built a mini-itx computer with a motherboard like this ASUS ROG Maximus VI. It’s ridiculous. With the memory DIMMs installed, it looks like the CPU will be surrounded by printer circuit board walls. It looks like some kind of futuristic play set of some kind. At $220 it is way out of my price range for a motherboard of any size. I don’t even spend that much on a CPU sans tax. There are a lot of luxury items built in but are they worth it? I appreciate the integrated wireless solution and while the sound card is a nice addition, I don’t know if I have the ears to be able to tell the difference. On the plus side, it’s a very good looking motherboard. Mantle? TrueAudio? Physx? All these exclusive or manufacturer driven technologies are all nonsense that force people to pick and choose GPU manufacturers based on features that their favorite games are using. However if there’s one feature that I would choose one GPU vendor over another for, it would be for NVIDIA’s G-Sync. The basic premise is simple. Displays refresh themselves at a fixed interval, but GPUs render frames at a completely independent frame rate. The disconnect between the two is one source of stuttering. You can disable v-sync to try and work around it but the end result is at best tearing, but at worst stuttering and tearing. NVIDIA’s G-Sync is a combination of software and hardware technologies that allows a modern GeForce GPU to control a variable display refresh rate on a monitor equipped with a G-Sync module. In traditional setups a display will refresh the screen at a fixed interval, but in a G-Sync enabled setup the display won’t refresh the screen until it’s given a new frame from the GPU. The G-Sync system is the gaming display technology we’ve always needed. Eliminating screen tearing and achieving pitch perfect display refreshes at all variable rates without the need to enable Vsync and triple buffering reduces input latency without sacrificing image quality. Even if I’m running a game at 60 FPS, this technology will also reduce the amount of judder I often see as well. There’s only two downsides to G-sync thus far. It will initially be only available for the ASUS VG248QE. The latter will be addressed with additional panels and manufacturers. I hope we see an 2560 x 1440 IPS panel with this technology. The former? I doubt we’ll see NVIDIA open this spec for their rivals to use as well which is a damn shame.